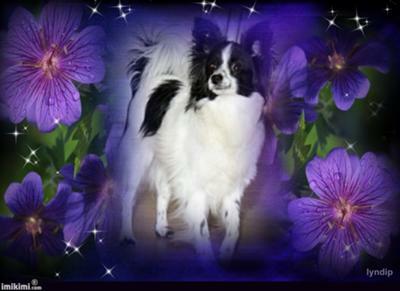 We share our home with two little Papillons and two little Pomeranians. 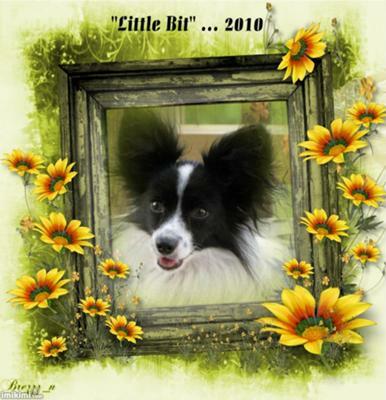 The first Papillon, Monty, I rescued from a puppy mill. When I adopted him, the shelter told me that they did not think he would come around because of his emotional damage as there seemed to be quite a bit of it. They also told me that they hesitated at adopting him out because of this reason. I told them that I was up for the task. Well, I guess I did not know what I was getting myself into! For the first six months he would not even come out from underneath the kitchen table. I don't think I have to tell you that he certainly wouldn't let anyone come near him either. That meant no vet visits and no grooming visits because we didn't want to further traumatize him. At that point, we adopted another little Papillon, Luiggi...thinking that a more well adjusted Papillon just might be the ticket for Monty. Luiggi has actually helped Monty learn how to play like a dog, be friends as a dog, and just plain be a dog. We were amazed, but still no connection to the humans. I tried having a groomer come into the house to bathe him and clip his nails...this put him back about ten steps. Needless to say, at this point I am becoming a little frustrated, a little saddened...and just feeling bad because I didn't know what to do. I made a lifetime commitment to this little guy and now I am wondering if this lifetime commitment is going to go to the end with me never having been able to pet him, talk to him, take him to the vet or the groomer. I didn't want him to be so non-trusting of the humans. I sat many hours crying and wondering what level of abuse would bring a poor animal to this state of mind!! I got the idea to hire a dog trainer who specialized in dog behavioral problems to come into my home since I couldn't take him out of the house to a trainer. I am sorry I did not think of this sooner, because the trainer I hired has helped Monty in so many ways. It doesn't happen over night for sure, but now I can pet him, and he will come to me. I can see in his eyes he wants so badly to be loved and touched just as the other dogs are. I think he is a lot happier now...in fact, he is a very happy little guy with his three buddies...he runs and plays and has a great time...he is coming along with the humans slow but sure. He is the sweetest little guy ever and I am so glad I didn't give up on him. 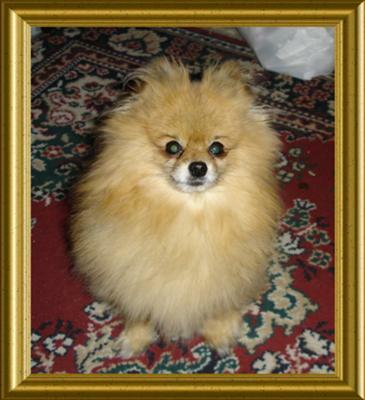 He has three other brothers...Luiggi, a Papillon, Hotrod (my hubby's dog) who is a Pomeranian and Teddy who is a Pomeranian/Pekingese mix. I think after a year now that I have had him, he is starting to feel like one of the family...at least the dog family anyway...hopefully it can only get better as time goes on! 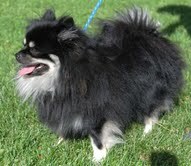 The moral to this story is: Not all puppy mill rescues wind up to be like Monty. On the flip side, some do. When you adopt a dog from a puppy mill, just go in with your eyes wide open and bring a heart that is willing to commit for life. The worst thing you can do with a dog who has been traumatized in a puppy mill is abandon it yet again. It is not easy, there will be many days that you just want to give up...but never give up! The rewards can far outweigh the frustrations!